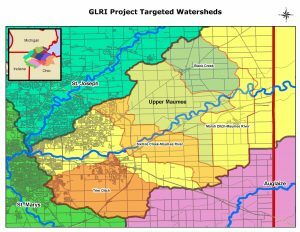 The GLRI cost share program is now available in critical areas throughout Eastern Allen County within the Upper Maumee watershed. Grant funds provided to the SWCD from the Indiana Department of Environmental Management are available to participants in the project on a per acre basis. If you have farm land in the Upper Maumee targeted watersheds: Black Creek, Marsh Ditch, Six-Mile Creek, and Trier Ditch, you may be eligible to participate in this project (See Map). Producers may be eligible for cost share up to 75% in payments for applied conservation practices such as cover crops, blind inlets, equipment modifications and many more. Please contact Courtney Scherer or Greg Lake at the Allen County SWCD office at (260)484-5848 ext. 3, if you are interested in learning more about this exciting program.